Trapshooting: The next high school sports sensation? 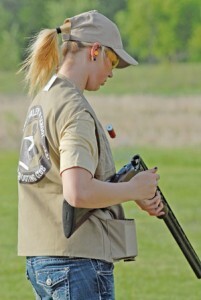 Apple Valley’s Katelyn St. Ana reloads her shotgun during a trapshooting competition last week. Photo by Mike Shaughnessy. Expectations were low when Apple Valley High School formed a trapshooting team earlier this year. If a handful of students signed up, head coach John Miller said he would have taken that and tried for more next year. Within about 15 minutes, though, registrations were approaching a cutoff point. Local schools, including Apple Valley, Eagan, Rosemount, Burnsville and Paideia Academy, are part of the Minnesota State High School Clay Target League, an organization that started in 2008 with three teams. Participation has doubled each year since, and in 2012 there are 57 teams representing 100 schools, with more than 1,500 students participating. Teams from Apple Valley, Edina and Jordan shot last week at Minneapolis Gun Club in Prior Lake. The WAVE (Watching Apple Valley Eagles), a faculty group that attends co-curricular events, went to the shoot and appeared to be impressed with what it saw. AVHS principal Stephen Degenaar praised the students’ dedication in a team meeting/picnic that took place during last week’s shoot. Although trapshooting is a club sport at Apple Valley, shooters are eligible for varsity letters and can get the team photo in the school yearbook, two things Miller said the students valued. Participation is quickly approaching the threshold for Minnesota State High School League sanctioning, but it’s unclear if the clay target league organizers will seek a spot under the MSHSL umbrella. Some teams shoot on Sundays because that’s when gun clubs have time available, but MSHSL bylaws ban Sunday practice or competition. The students also might be helping to ensure the sport’s survival. Trapshooting has an aging demographic, which caused Jim Sable, executive director of the state clay target league, to wonder if the sport would even exist in Minnesota a decade or two from now. John Nelson, a director of the state clay target league, said an estimated 30 to 40 percent of Minnesota’s gun clubs have closed in the last 10 years. Sable said he figured the only way to revive trapshooting was to stir up interest in schools. While the league might not double in size in 2013, Sable said it is expected to grow again next year. 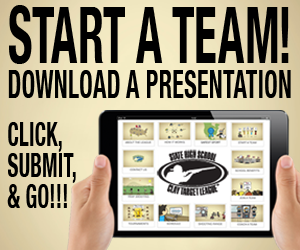 Joining a team isn’t as easy as just showing up and saying you want to shoot. Participants must have firearms safety certification and either own or have access to their own equipment. Not many of the Apple Valley team members had clay target shooting experience before signing up; the majority were hunters or shot other kinds of targets. St. Ana, one of three girls on the Apple Valley team, said she sometimes accompanied her stepfather to shoots at the Minneapolis Gun Club. Tyler San Agustin, another Apple Valley captain, had experience in sporting clays, a form of target shooting intended to simulate hunting situations. Apple Valley is in the bottom half of its league (called Conference 5A), which Miller and the captains said was probably to be expected in the team’s first year. San Agustin said one of the attractions of the trapshooting team is it allows him to still compete in a spring sport (in his case, track and field) while shooting once a week. Team members shoot in groups, with those involved in spring sports shooting in a later group so they can come after practice. 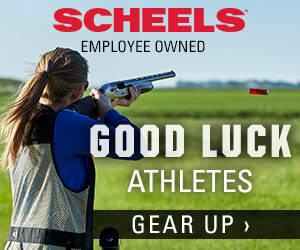 As word gets out about the program, a selling point might be trapshooting’s cost relative to varsity sports. Shooting vests and hats were donated, but the students pay the remaining costs. Still, at Apple Valley those costs range from $230 to $280, mostly for facility rental and ammunition. “It’s a lot cheaper than hockey,” said Apple Valley hockey player and trapshooting captain Ben Keckeisen.